A Spanish Colonial console cabinet from about 1915 has a later chest of drawers inside. 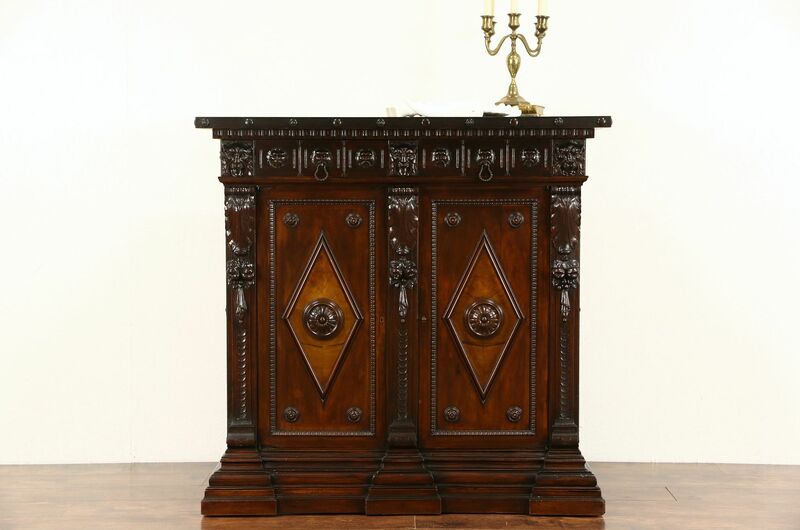 Carved lion heads and wrought iron hardware are authentic on this European vintage furniture from Spain. Drawers have hand cut dovetail joints, interior drawers have hand painted decoration and were custom made and installed later. The renewed deep finish is in excellent condition on solid oak and walnut with matched burl diamond shaped panels. Doors have working locks. There is a loss on the bottom of the left door, see photos. Measurements are 48 1/2" wide, 23" deep and 47" tall.